Here's a good rule to remember: If a team of scientists are transporting some genetically-mutated scorpions on a commercial airline flight from Australia to Los Angeles, one that is packed with an oddball assortment of stock characters, then you pretty much know that some sort of nasty, unfortunate event is bound to occur. 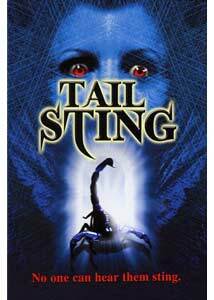 That's the premise of Tail Sting, a looooooow budget entry in the often ignored "giant scorpions on an airliner" genre. In this purely goofy creature flick, the once normal-sized scorpions somehow grow into five-foot-long killing machines after an accident in the plane's cargo hold. From that point on, it is a series of laughable latex critters scurrying down aisles, repeatedly poking their giant stingers through random chests of expendable, hapless victims. There isn't really much explanation made as to how the scorpions attain any element of surprise, since the aisles are basically their only avenue of travel, (even the giant "queen" ends up in the cockpit somehow, much to the understandable surprise of the flight crew). Laura Putney is Dr. Jennifer Ryan, the eventual default leader of the scientists responsible for the big beasties. She bears more than a passing resemblance to Heather Graham, and has a recurring tendency to make goo-goo eyes at hunky pilot Jack Russell (Christian Scott), which almost makes her more of a hindrance than a help. Putney's Ryan, one of the only people who can stop the deadly scorpion menace, actually takes time to repeatedly woo Jack with the rapid eye-fluttering worthy of a high school girl and her first crush. It seems that love, in all it's glory, has caused her to understandably forget that there are FIVE-FOOT SCORPIONS KILLING EVERYONE ON THE PLANE! Tail Sting might have been a better film with a bigger budget, because there are too many moments that seem to suffer comedically from being apparently under funded. Production values are pretty minimalistic, with an alleged airplane cabin that looks like a set resurrected from that old Twilight Zone episode with William Shatner, the one where that big furry thing is on the wing. The set is big, spacious (is that a cathedral ceiling?) and could not look any less like the interior of an airplane. Director Paul Wynne has to use, reuse, and use again some of the exact same stock footage (complete with white specks) of a plane flying over the ocean—I think the shot is used at least ten times in Tail Sting. The fact that there are only about 15 people (I mean "victims") on the whole flight, and that characters can easily sneak down into the cargo hold unnoticed, even though the entry is directly in front of the cockpit door, are just some of the leaps the viewer is expected to take on this journey. Image Transfer Review: York Entertainment has issued Tail Sting in a 1.33:1 full-frame image, and the film's decidedly low-budget look isn't really hampered all that much by the lack of a widescreen presentation. Colors are rendered pretty well, but fleshtones do run a little too red overall on this transfer, and most of the darker scenes reveal a heavy amount of grain. The stock airplane footage has quite a bit of distracting white specks, enough to be a reminder that it's the same footage being used over and over. Audio Transfer Review: The packaging claims the audio mix is 5.1, but it comes across more like a traditional 2.0 surround presentation. Rears remain silent throughout, with no noticeable separation across the front channels. Dialogue is cleanly mixed, which may or not have been necessarily a good thing. For what is obviously a low, low, low budget horror film, the mix is certainly far from awful. It's just not remarkable in any way. Extras Review: A Behind the Scenes segment (10m:09s) is the primary extra of merit on this one, and it opens with a few minutes of some generic "Yeah, I know this is a low budget movie" comments from producer Morris Ruskin. The best part, and fortunately the bulk of the piece, centers on the creation of the giant scorpions used in the film. While the creature effects in Tail Sting are not particular noteworthy, I always find it interesting to see the hard-working people who lovingly, and seemingly painstakingly, design the rubber and latex components. The disc is cut into a generous 30 chapters, and also includes five trailers (Tail Sting, R.I.C.C.O., Dark Carnival, Living in Paradise, The Triangle), as well as Spanish subtitles.